Health care providers are under pressure to improve both efficiency and quality. The two objectives are not always mutually consistent, because achieving higher levels of quality may require additional resources. The aim of this study is to demonstrate how the nonparametric conditional approach can be used to integrate quality into the analysis of efficiency and to investigate the mechanisms through which quality enters the production process. Additionally, we explain how the conditional approach relates to other nonparametric methods that allow integrating quality into efficiency analysis and provide guidance on the selection of an appropriate methodology. We use data from 178 departments of interventional cardiology and consider three different measures of quality: patient satisfaction, standardized mortality ratio, and patient radiation exposure. Our results refute the existence of a clear trade-off between efficiency and quality. In fact, the impact of quality on the production process differs according to the utilized quality measure. 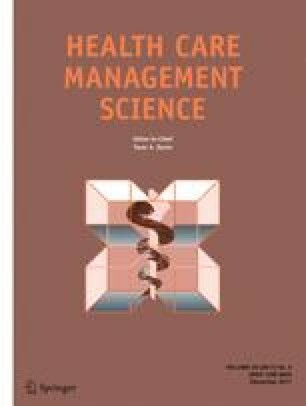 Patient satisfaction does not affect the attainable frontier but does have an inverted U-shaped effect on the distribution of inefficiencies; mortality ratio negatively impacts the attainable frontier when the observed mortality more than doubles the predicted mortality; and patient radiation exposure is not associated with the production process. An erratum to this article is available at https://doi.org/10.1007/s10729-016-9391-1.